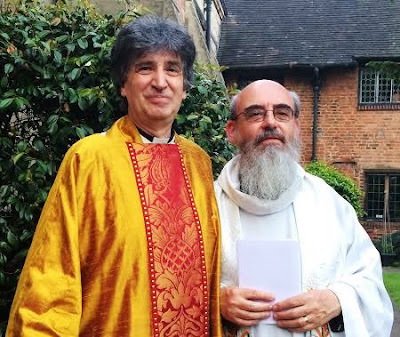 Canon Patrick Comerford, Lecturer in Anglicanism, Liturgy and Church History in the Church of Ireland Theological Institute, Dublin, recently preached at the Festal Eucharist in the Chapel of St John’s Hospital, Lichfield. Canon Comerford spoke of the chapel of Saint John’s Hospital – an almshouse dating back to the late 15th century – as his spiritual home, recalling his teenage years in Lichfield, where he has strong family roots, and where he began working as a freelance journalist with the Lichfield Mercury. He also recalled how his experiences in Lichfield had led initially to become a journalist and eventually to ordination. Canon Comerford is pictured (right) following the service, with Canon Andrew Gorham, Master of St John’s Hospital. The feature was illustrated in print with attractive photographs of Oia in Santorini, a village taverna, and the Temple of Apollo, and on the web with Elafonisi beach in Crete, and The Temple of Apollo, Corinth. 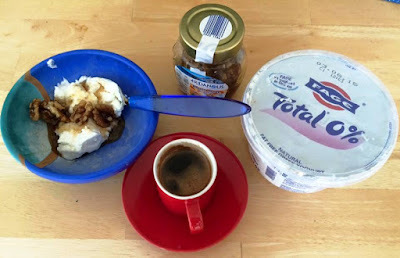 1, “Buy Greek.” For example, he said we might want to boycott “Greek-style” yoghurt in favour of the real thing. 2, “Tackle their smoking problem.” He points out that more than 40% of Greek adults smoke, more than double the rate in the UK, with all the attendant costs for the Greek economy and healthcare system. 4, “Pick your side.” He says one of the most enjoyable way to support Greece, and to get some common feeling with many Greek people, is to pick a team to follow. By the end of the day, this photograph had attracted 130-140 “likes” between my page eleven shares, and numerous comments. I decided that while the Greek crisis continues I should continue with Alex Andreou’s theme for the next few mornings, and suggest Tiny, Tickable, Achievable Targets as ways of expressing support for Greece and Greeks in the present crisis. You may not change the agenda in Brussels, but you can make yourself and your family and friends feel more positive about Greece, and show solidarity in a humane way. This morning I am suggesting picking a Greek football team to support as a gesture of solidarity. Athens has three big teams in the Greek Superleague: Olympiakos, Panathinaikos and AEK Athens, known collectively as the POK. Olympiakos were last season’s champions, and Panathinaikos is in Europe in the coming season too, along with PAOK from Thessaloniki, Asteras Tripoli, and Atromitos from suburban Athens. But since I first visited Crete in the 1980s, I have been more interested in the fortunes of the island’s two main teams, OFI and Ergotelis. OFI or Όμιλος Φιλάθλων Ηρακλείου (Omilos Filathlon Irakleiou, Club of Fans of Heraklion) are based in Iraklion, and are popularly known among fans as “The Snakes.” Outside Greece, the club is generally known as OFI Crete, although Crete is not part of the club’s official name. It is a reflection of the depths of the Greek financial crisis and an indication of how austerity and imposed cuts are hitting every level of society that OFI was forced to withdraw from Greece’s Superleague in March because of mounting debts. OFI had repeatedly broken league rules since the start of the season by failing to pay players, and the crisis had forced the former Italian coach Gennaro Gattuso to quit in January. OFI was punished several times in the last season for failing to fulfil their financial commitments. This included a 10-point deduction in January for owing money to past and present players and staff. Some players had not been paid for a year. Another cash-strapped club, Niki Volou, based in Volos, was relegated for financial reasons in January. OFI was languishing at the bottom of the Superleague, when the club withdrew, leaving the top flight with 16 of the original 18 teams. OFI plays at the Theodoros Vardinogiannis Stadium in Iraklion. Among Greek provincial clubs, OFI has had most first division appearances, and the club’s celebrated successes include winning one Greek Cup and one Balkans Cup, and they have competed seven times in UEFA competitions. In 1993-1994, OFI achieved the unthinkable when they eliminated Slavia Prague in the first round of the UEFA Cup and Atlético Madrid in the second round, both 2–1 on aggregate, only to be eliminated in the third round by Portugal’s Boavista. OFI was founded by athletes in a gym in Iraklion in 1925, when they opted for their black-and-white colours because no other team in Crete played in the same combination in Crete. There is traditional rivalry between OFI and Crete’s other one-time Superleague side, Ergotelis, who play in the Pankritio Stadium in Iraklion. The first game between two was a friendly in 1929, but it was abandoned after 35 minutes when violence broke out between the players. The name of PAE Ergotelis (ΠΑΕ Εργοτέλης) honours a famous ancient Cretan expatriate Olympic runner Ergoteles of Himera. 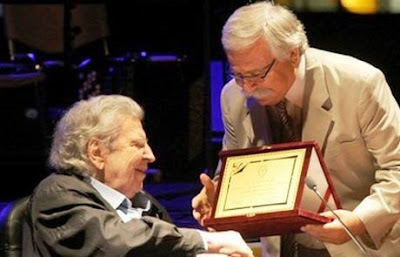 When the colonels seized power in 1967, they branded Ergotelis as an anti-national organisation after the club’s directors allowed the composer Mikis Theodorakis, a key voice opposing the regime, to perform a concert in Martinengo stadium. Several months later, the club was relegated to amateur status under a new decree that each regional city in Greece could be represented in the Second Division by only one team. At the time, both sides in Iraklion were playing in the Second Division. At the end of the 1966-1967 season, OFI and Ergotelis finished in third and tenth place respectively. Both clubs had secured their place in the next year’s season, but Ergotelis was relegated to amateur status by the colonels’ new decree. The decree also allowed teams remaining in the second division to sign any number of players from the relegated clubs. Using this loophole, five of the best players were poached from Ergotelis by OFI, who remained in the national competitions. Meanwhile, the directors of Ergotelis board were prosecuted and the club was practically disbanded in 1967. It was the colonels’ revenge for the Theodorakis concert, and piled political tensions on top of the strained relations between the neighbouring clubs. After the junta fell in 1974, several attempts were made to bring Ergotelis back to top-flight Greek football. But most of these were met with failure, and Ergotelis languished in the lower divisions for more than 30 years. The old rivalries were revived when Ergotelis made their longed-for comeback in the early ’00s. But in recent years, both sides have shown goodwill and their rivalry has become a friendly one. OFI fans celebrated Ergotelis’ promotion and attended home games during the club’s first season in the Superleague. Ergotelis even loaned their long-time scoring legend Patrick Ogunsoto to a financially-weakened Beta Ethniki OFI side in 2010 for no fee, in an attempt to help OFI in their struggle to return once again to the Superleague. However, Ergotelis finished 16th in the Greek Superleague this season and because two of the original 18 clubs had already been thrown out they were regulated. For different reasons, the neighbours in Iraklion find themselves in the same division in the coming season. The colonels failed to wipe out Ergotelis or to drive a wedge between football fans in Crete. Where they failed, should European politicians and bankers who are imposing impossible demands on Greeks be allowed to succeed? Football in Greece often has a political agenda. Alongside basketball, it is the most popular sport among working class Greeks. Picking a Greek side to support is one small gesture in solidarity with Greeks who suffering today. But it is full of meaning, and a step worth taking. Perhaps you might even consider buying a season ticket and donating it to a fan who can no longer afford it. This would make someone happy, transfer hard-needed cash from the rest of the Eurozone to Greece, help pay the wages of long-suffering players, and help a beleaguered club to keep the show on the road.